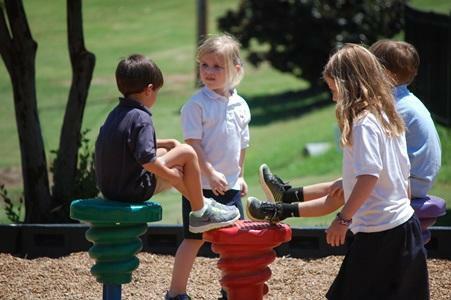 Magnolia Heights’ 3K students have 2-day, 3-day, and 5-day programs. 3K day begins at 8 a.m. and ends at 11:30 a.m. Students must be potty trained before admission. A 4K student’s day begins at 8 a.m. and ends at 11:30 a.m. Monday through Friday. In addition to early childhood classes, 4K students also have classes in art, computer, music, and P.E. 5K students attend a full day program that begins at 8 a.m. and ends at 2:30 p.m. In addition to early childhood classes, 5K students also have classes in art, computer, music, and P.E. Elementary students have an average class size of eighteen students. The school year is divided into four nine-week reporting periods. MHS students are taught using a phonics-based reading program. Special classes for the elementary students are foreign language, art, music, computer, library, and P.E. Each class presents a class play during the year. Elementary students participate every year in a multicultural, world, or state fair. They also participate in the Accelerated Reader Program. Field trips are scheduled throughout the school year to the Pink Palace Museum, Playhouse on the Square, Memphis Zoo, Tunica River Park, Strawberry Plains, IMAX Theater, and many more. The fifth grade schedules an overnight trip to the Space Center in Huntsville, Alabama, in April each year. Technology is readily available to these kindergarten and elementary students. Two iPad carts and a Chromebook cart have been provided by the MHS Parents’ Club for use in the classrooms, along with the computer Lab in Baker Hall. MHS offers an extended care program for grades 3K-6th grade. Children may stay until 6:00 if needed.